One of the best things about the holidays is the excuse to bake to excess. It’s an excuse to try new recipes for decadent, sweet goodies or make some tried and true favorites. So over the last few days I’ve indulged in baking my little heart out. 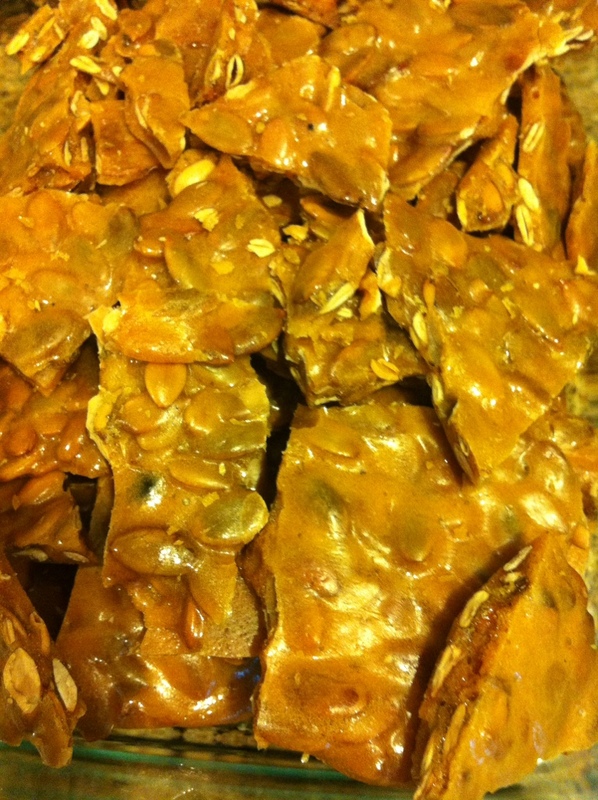 are a sweet, salty tasty treat that smells amazing. 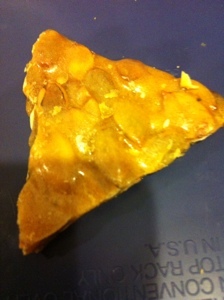 And who knew brittle was easy to make?!? Today I went a little more traditional. 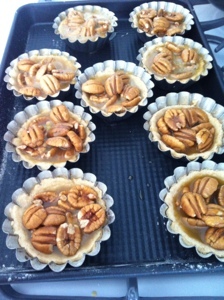 Lemon meringue pie and pecan pie. 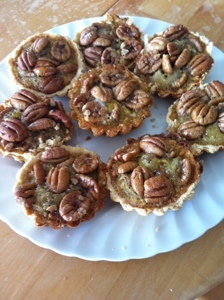 I did make little mini pecan pies instead of one large pie (they are just so cute) for a change. 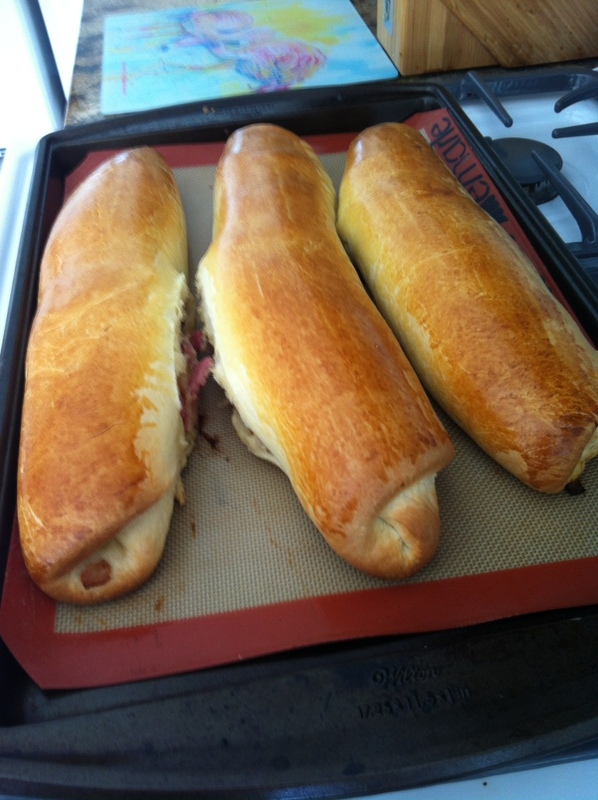 I was a little concerned that they wouldn’t look good, but … well, they came out perfectly. 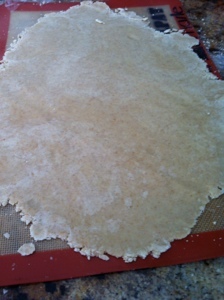 I started with a basic pie crust recipe, but changed out a half cup of regular flour for whole wheat. I wanted a little nuttier crust, so I think this worked well. I love the little tart pans, but I almost never use them. 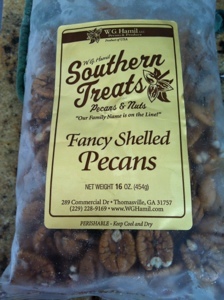 I also get to use the fresh pecans Bob’s mom gave me. I have to be very careful to not eat the entire bag myself. I did keep enough for the pies. 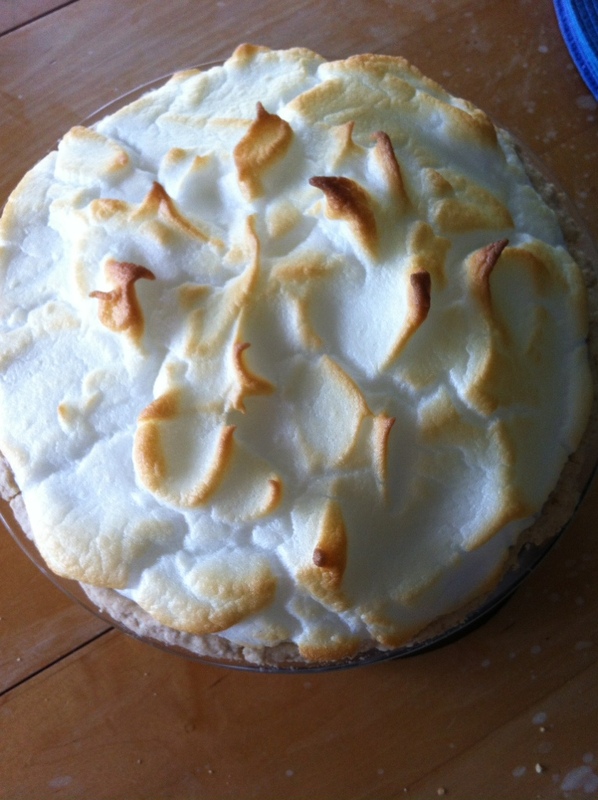 I also used the same crust for the lemon pie. 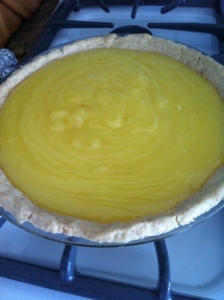 As a kid, I thought the yellow color of a lemon pie came from the lemon zest or food coloring. It’s nice to know it is just the eggs. They really do give a good color to the filling. And for one of the first times ever, the pie came out picture perfect! And it would not been the holidays without bacon bread. I found my recipe again (or at least the base recipe that I use to make the bread) so I’m hopeful that the batch will be perfect. It certainly looks perfect. Bob also lost one of his gadgets to me and baking. 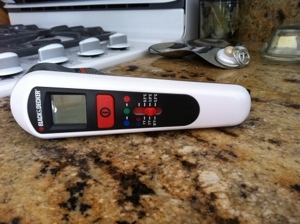 infrared thermometer. This thing came in so handy for the brittle and the bread (have to get the temp of the water/milk/butter mixture right or the yeast dies which is not good for bread). I’ve now hidden it in the kitchen and told him I’m claiming it, since is potentially means more brittle and treats for him, he’s not objecting. Hope everyone has a wonderful Thanksgiving and a blessed Hanukkah. It’s not often Bob asks me to write down a recipe for something I’ve made. He has suggested it on occasion, but he almost never specifically asks. This is due in large part because he knows I don’t measure anything and I often change a recipe midstream when I realize I’m out of an ingredient or decide something else sounds good. But the stew today was really, really good. Lots of flavor, but not hot-spicy. So, as best as I can remember it …. 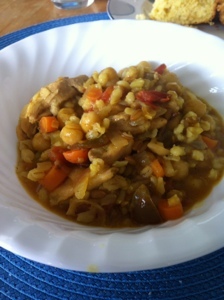 The Middle Eastern Chicken Stew. Heat oil in stew pot/Dutch oven and add the chicken with some salt and pepper. 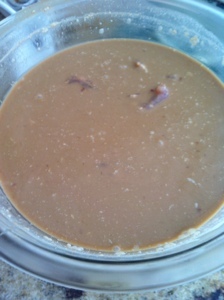 Brown the chicken then remove from heat. 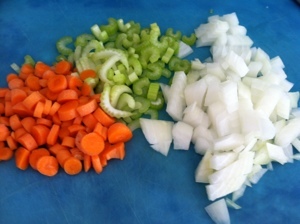 Add the chopped celery, carrots and onion to the pot and sweat the veggies until they are a little soft, about 5-7 minutes. Add the garlic and cook another two minutes. 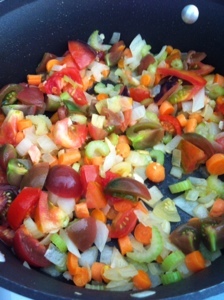 Add tomatoes and spices; mix well. 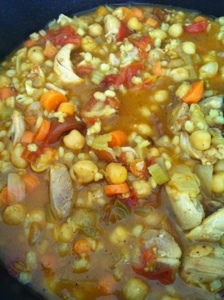 Add chicken broth, chicken, barley, chick peas, rice and bay leaf. Let cook over medium to medium low heat for an hour. Adjust seasoning to taste and serve. Now, the rice … I know is a little unusual, but I use a rice mix a lot. Well, I did use it all the time in Jersey, but I’ve had a hard time finding it in Florida. However, I did find it in the grocery last week, so I had it on hand. It’s three different rices with rye and barley. It isn’t too much of any one type so the favors are great. 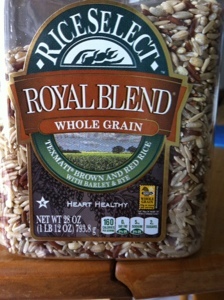 I really like this as an alternative to plain brown rice. And it went surprisingly well with cornbread. 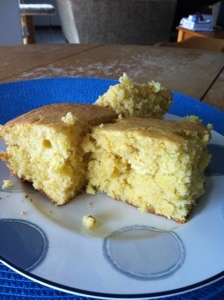 I fully admit to being a Jersey girl, so cornbread is not something I make often, but it passed Bob’s southern taste buds – he even went for a second piece. Ever since the coffee pot died, we … ok, I have been searching for the perfect, easy to use and clean coffee pot. The one Bob found works great for the weekday morning when we get up about the same time, but by the time he gets up on the weekend, the coffee I made when I got got up is either cold or gone. The pot we have, while it does one cup, is messy and takes a bit to clean between cups. So, we found a little Mr. Coffee that can use pre made or your own coffee for a single cup. (I don’t like having to use the k-cups … I fully admit to liking my own coffee better.) So we tried it today. Not bad. The coffee is a little weaker than I would like, but I can l,ay with the grind and amount and keep trying. I can also make a single cup of hot water for tea or hot chocolate. I will keep my eye out for something else, but for now, it works. This weekend I was in the mood for peanuts. Or at least something with a good peanut flavor in it. I searched a ton of satay recipes but didn’t find one I really liked. So, as usual, I just took those recipes as a guide and made it up as I went along. 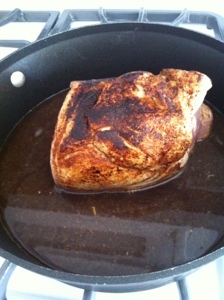 Last weekend I used part of a pork loin for dinner. This weekend I took the rest of it, cut it into medallions and marinaded it in a combination of coconut milk, peanut butter, soy sauce, chili paste and garlic. 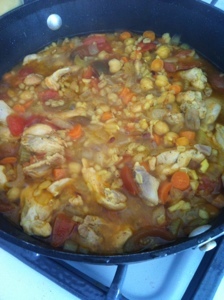 I fully admit that it doesn’t look appetizing, but it smelled pretty good. After a few hours in the marinade, I cooked the medallions in a hot pan, just to cook them through. 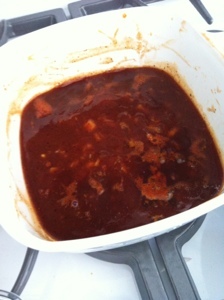 While those were cooking, I made a sauce of vegetable broth, soy sauce, mirin, and garlic and brought it to a boil. After it reduced a little I added peanuts, sugar, chili powder and cilantro to the food processor and mixed it all together. 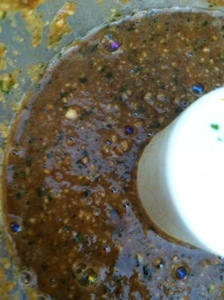 The result was a super flavorful sauce that if I added some more liquid to would make a great dipping sauce for spring rolls. I also wanted some rice, I was just in the mood for rice. So I made some and some edamame for texture. To go along with the whole dish, I made a cabbage salad with a dressing of honey, soy sauce, sherry vinegar, chili paste, garlic, peanut oil, sesame oil, canola oil (I mixed them together to prevent any one flavor from over powering …. and I had them all on hand and could not decide which to use) and ginger. 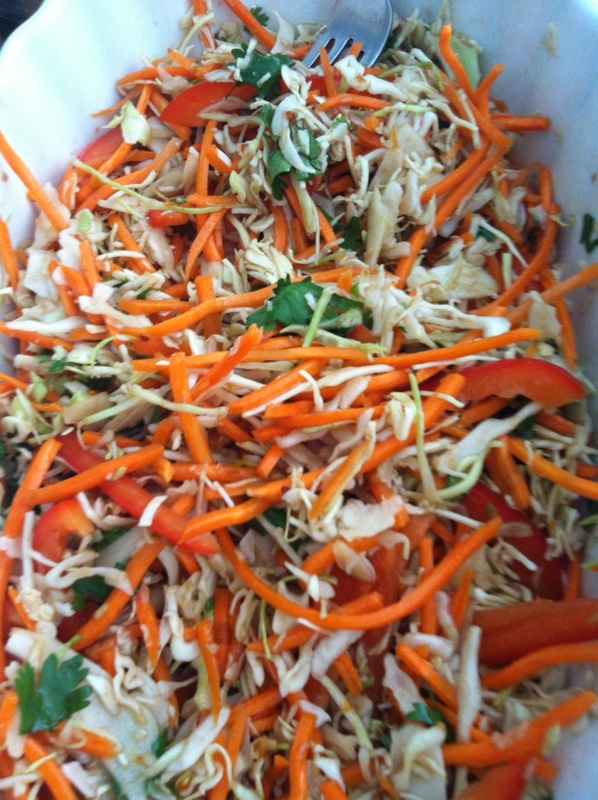 Cabbage, carrots, red peppers and cilantro finished the dish. The final product was mostly really good. The rice was a touch over cooked, but I’m still glad I had it there. 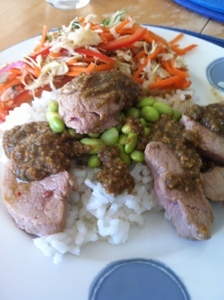 The peanut sauce was the perfect and Bob said the pork was super tender. (I will agree on that one) best part is I have the rest of the salad with the edamame for lunch tomorrow and Bob can have the leftover pork with the peanut sauce. Recently, after another round of playing “what did this use to be” with the fridge, I decided to start shopping in a more European fashion. I pass three or four grocery stores on the way home so rather than make one large trip each week, I’m going for just what I need for that meal shopping. It means more trips to the store, and some very creative cooking/substitutions on occasion but I don’t have to feel guilty for not cooking that zucchini or finding the molded something in the back of the ice box. The other downside is that when I don’t stop at the store, I have limited options for dinner. Earlier this week I decided I’d do an egg dish. I was going to go for a nice soufflé but Bob is more of a quiche man. 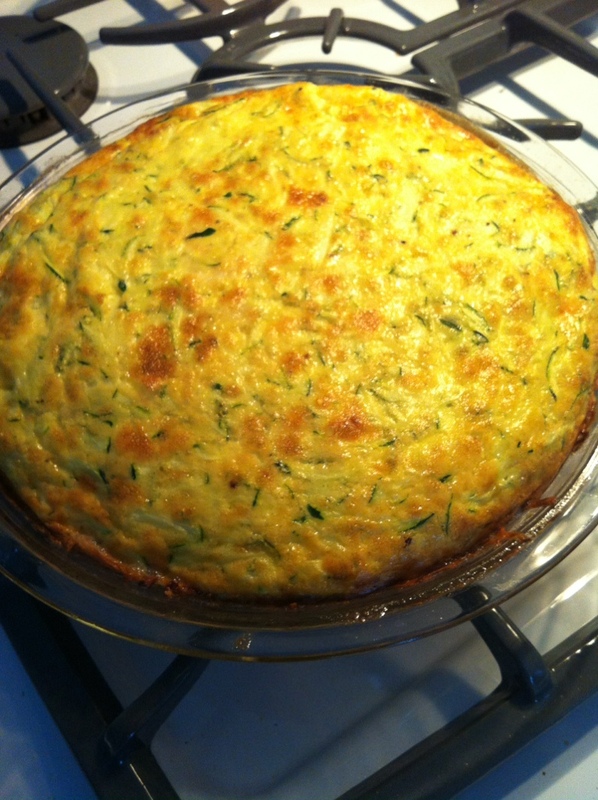 And I can say that because when I asked if he would be ok with a soufflé he said he would “lean more towards a quiche.” (yes, I still have the text) so I changed my scouring of soufflé recipes for quiche recipes. I didn’t see anything that struck me as perfect so I improvised. Don’t judge too harshly, but I was fascinated by a Martha Stewart recipe for a soufflé with a hash brown crust. Now this recipe calls for things I don’t have on hand like frozen hash browns, sour cream and a dozen eggs. But I do have potatoes, some eggs and heavy cream so … I use a pie plate instead of a springform pan and buttered the bottom. I grate the potatoes and mixed them with one egg and some grated Parmesan. Bake in 375 oven for about 15 minutes. Meanwhile, I mixed together 4 eggs and 3/4 cup cream. To that I added one grated zucchini some goat cheese and some more grated Parmesan with salt and pepper. Mix well so the goat cheese smooths out and the whole thing is nice and creamy. Once the potatoes set, fill the shell and return to the oven for another 25-30 minutes. I have to admit, this would have been way better with bacon, but I didn’t have any on hand. It was good – really good – but everything really is better with bacon. I also think I was just in the mood for soufflé, but this has a light texture and great flavor; it is probably one of the simplest dishes I can make. Sometimes simple is best. Today was a day for puttering; a day for relaxing and just doing things I want to do, not that I have to do. So Mom and I met up early and headed to the nursery to find some flowers. I wanted something in reds and white for the holidays, which proved a little more difficult than I anticipated. 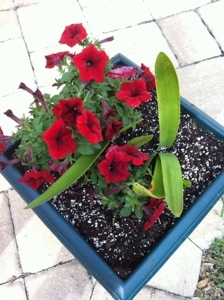 There were some beautiful blood red velvet petunias, but not enough to do the front garden. But they were gorgeous so I picked them up for the back patio. The pictures don’t do these justice, because they are just a deep, deep red and a perfect color for Christmas. 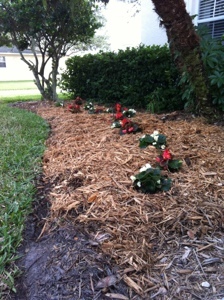 For the front we went with begonias. White and red begonias with beautiful green leaves. We moved the bougainvillea to the back so it can get sun since Bob doesn’t want the tree on the side taken out (more on that in a second) and then alternated the begonias. My hope is that these will grow together and blanket the front garden. But the bougainvillea. My poor, poor plant. I bought it a few years ago because I though it was so beautiful. Variegated leaves and salmon flowers. So stunning, but it never did well in the front. And I didn’t want to add pots to the back so we kept it in the front and just hoped. Well … I finally found a pot I wanted to actually have in the back. I still can’t describe the color exactly, but the blue is just stunning. 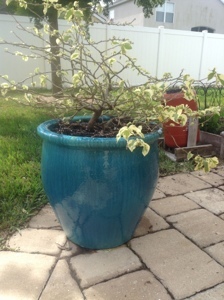 Mom and I saw it as soon as we pulled into the nursery and that was it – this was the pot for the bougainvillea. 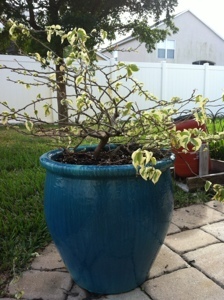 So … We picked it up and replanted it in the back. It get lots and lots of sun so my hope is that by the summer it will bloom. 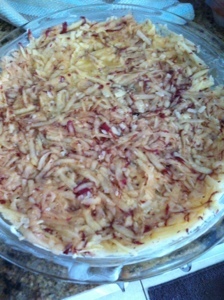 I wanted to do something a little special for them so I added some fried shallots to the top before baking them. 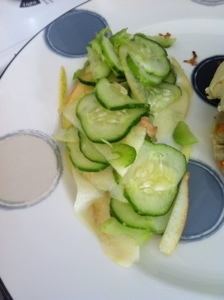 To balance this just a little I made an apple, cucumber and celery slaw – just those three ingredients with salt, lemon and a lint bit of white balsamic vinegar. 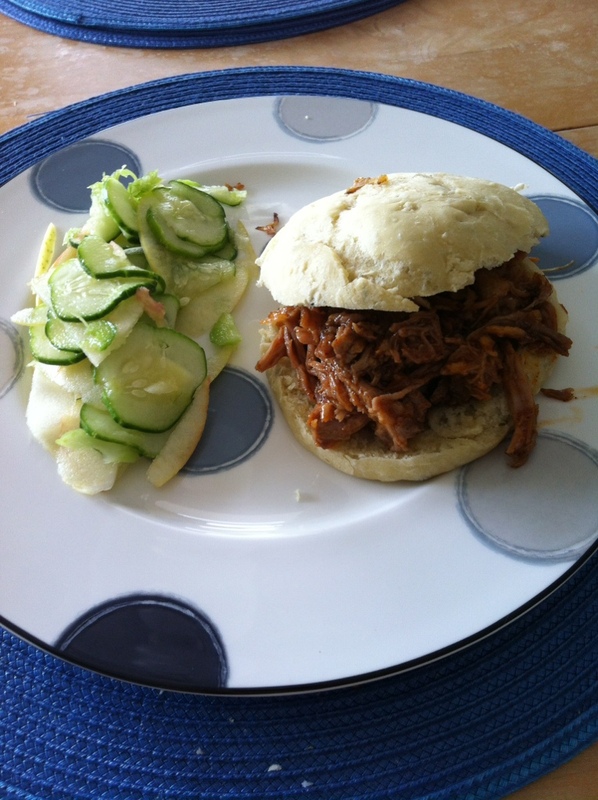 This was one of my best pulled pork sandwiches ever. I’m not exactly sure why, but this is what happens when you don’t write down what you do. It’s a good thing I made a few dishes last weekend. It was a very busy start to the week so having something to warm up was really, really nice. And tasty. But later in the week I made a point of getting out of work on time and cooking something that I’ve been dreaming about since I saw a recipe for it a few weeks ago – Caramelized onion tart with roasted tomatoes and goat cheese. First step in this was acquiring a good, mild goat cheese. 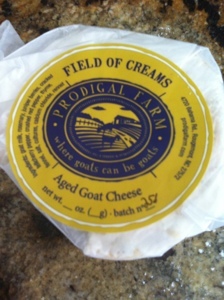 When Mom and I went to the farmers market last weekend I made a quick stop to the cheese shop and found a super rich, really creamy goat cheese. This one has a nice herby quality but it is such a mild flavor it becomes difficult to stop eating it. I briefly debated about a whole wheel vs a half wheel but, really, it’s goat cheese. Whole wheel. It’s not like we won’t eat it. 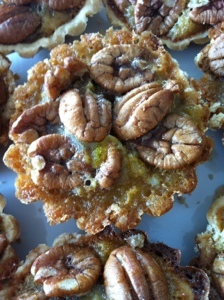 So … The tart. Step one, start to caramelize some onions. There are two tricks to this I find – use more than you think you will and be patient. Very, very patient. 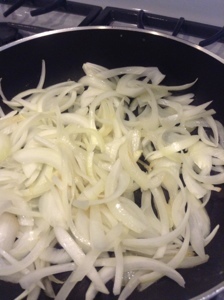 Despite what some recipes say, you cannot rush caramelizing onions and it takes a good 45 minutes to get them right. Medium heat and judicious stirring. In the meantime, the tomatoes. 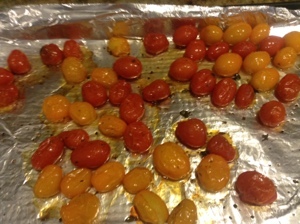 I picked up some really pretty yellow and red cherry tomatoes last weekend so I used those with herbs (thyme, oregano, salt and pepper) and roasted them for about 20/25 minutes. 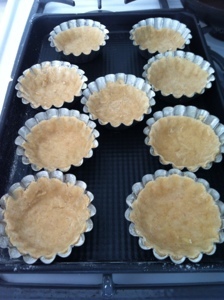 After the tomatoes came out, I popped in the puffed pastry shells. Yes, I could have made a dough or I could have use regular sheets of puffed pastry, but these looked so cute I just decided to go for it. 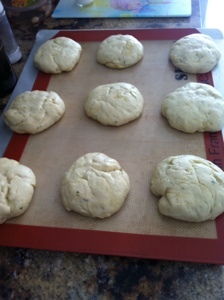 But once they puffed, I took the tops just in time for the onions to be done. 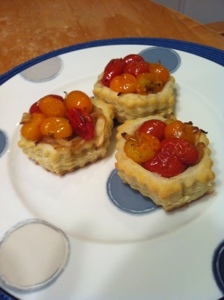 So … little rounds of goat cheese on the bottom, caramelized onions in the middle and topped with the tomatoes. 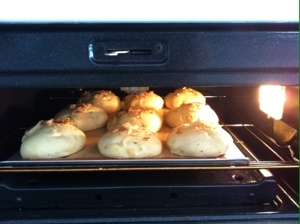 Back in the oven for fifteen minutes or so and …. Dinner. 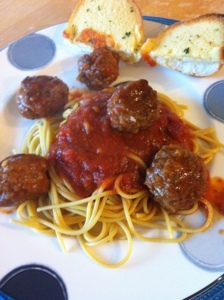 Friday I went much simpler, and way more traditional – spaghetti and meatballs with garlic bread. So when John came down to see Thor with us, we had a nice repast for dinner with the cheese and some cider for me and beer for the boys. 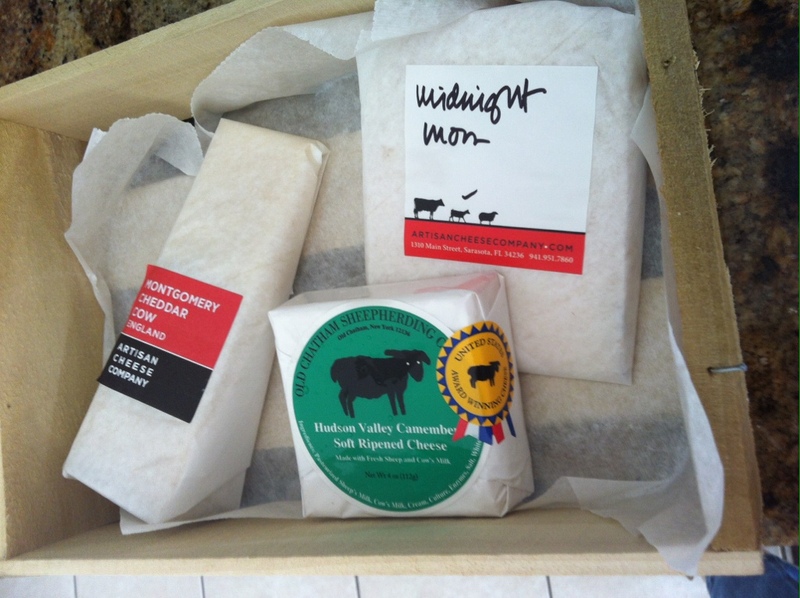 The Midnight Moon is still one of my favorite cheeses ever. I can’t describe it, but oh wow is it good. Combined this month with an English Cheddar and a Camembert and we had a great little dinner. 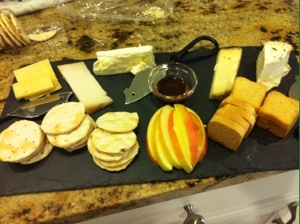 I included the Field of Creams and the other cheese I picked up last week so it was a lovely little dinner. I did a puller pork today, but I’ll save that for a separate post. The weather front came through yesterday bringing actual fall like temperatures. For south Florida this means I can turn the air off. Have I mentioned how much I like living here recently? But beef stew. I’ve made several iterations of this over the years, some more successful than others. Today I decided to make a batch so I had options for lunch and dinner this week. (Made the farro butternut squash salad yesterday.) No recipe, just what I remembered worked. So how did it turn out? Rather well. 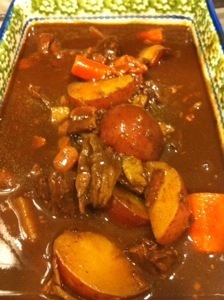 I am now firmly convinced there are a few essentials for good beef stew. 2. Shallots. A taste the crosses onions and garlic, I find shallots indispensable in beef stew. I can add garlic and onion, or not, but for some reason if I leave out the shallot, it just doesn’t work. Chop small like garlic and don’t over cook. 3. 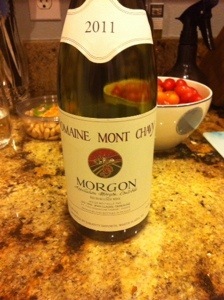 Good wine. I don’t advocate really expensive wine for cooking, but if you won’t drink a glass, don’t cook with it. Beef stew (at least the way I make it) has less than a half cup of wine. It varies as I don’t measure, but figure about a third of a cup. The type doesn’t make a difference, as long as it’s pretty good. I’ve used Zinfandel, Pino Noir, Bourdeux, and Cabernets. I refuse to spend more than $20 for a bottle of red, and usually it’s less than $15. But the good wines produce good sauce and sauce is the key to good beef stew. 4. Cook low and slow. 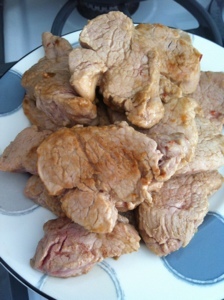 Slow cooker, pressure cooker or stove top, low heat and long cooking times produces the most tender beef. It also allows you to use chuck roast and get just as good a flavor and texture as a filet. Low heat and for a few hours. It does pay off. 5. Aromatics and seasoning. Do not skimp on these. 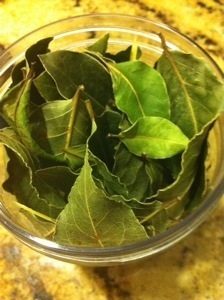 Salt the meat, use herbs – bay leaves, thyme, rosemary, oregano etc. They all work but if you don’t use them you will not get the flavor. The best beef stew I ever made had thyme, oregano and bay leaves in addition to salt as I browned the meat and again at the end of cooking. 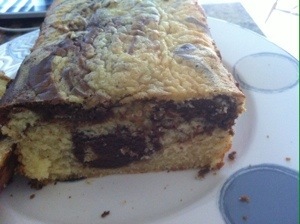 Oh … And I made a buttermilk marble cake today. It needed no icing. At all need I say more?